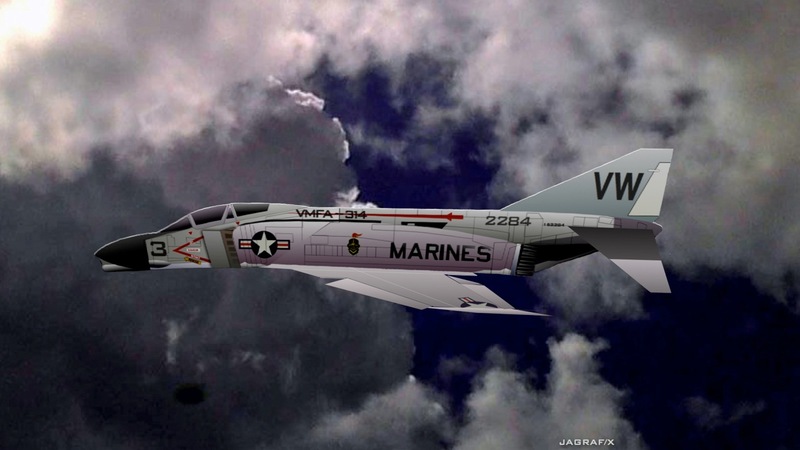 This is a members/enthusiasts website, not connected to the U.S. government or military, to share data and stories about Marine Corps Fighter/Attack squadron VMFA-314 at the time when it flew the F4B Phantom II from the Chu Lai airbase in support of military operations in Vietnam. You can learn more about the squadron on its official Marine Corps website or on Wikipedia. You can also learn more about the Phantom II on Wikipedia. This website was started in 2006 to help with the planning for a squadron reunion in January, 2007. See the story below! VMFA-314 History - It's Available! 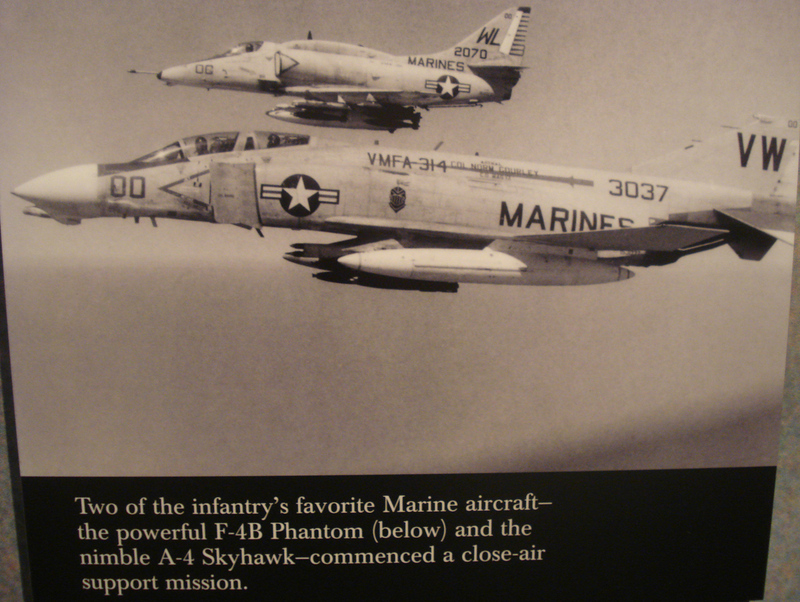 "The USMC F-4 Phantom II Squadron History Series, No. 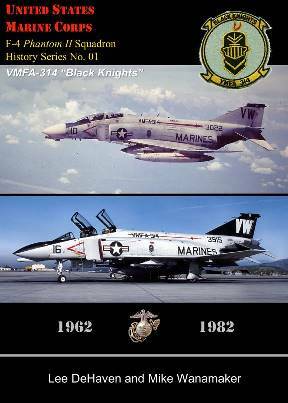 01, VMFA-314 Black Knights, 1962 - 1982, is now available at Smashwords for $9.99. . A PDF (15 MB) from Smashwords is also available." Mike and Lee R. De Haven have been working on this for several years. I've read drafts and was very impressed with the detailed research that Mike and Lee have done into the F-4 history with VMFA-314 and the many, many operations that the squadron was involved in, not only in Vietnam but also between the years 1962-1982. I think former Black Knights and aviation buffs have much to learn from this book. "I was going though dad's old emails and saw your anniversary email to dad. I remembered that you didn't know about dad's condition until your call to him. Unfortunately I have more bad news about dad, he passed away April 25, he suffered a heart attack, brought on by some odd happenings. I just thought you should know this before you go to celebrate your Nov 1 (I think) landing . He is going to be buried in Arlington, we've been told that it could be 5 months maybe longer before he's laid to rest. Just thought you should know.. "
This is LtCol Black's obituary. 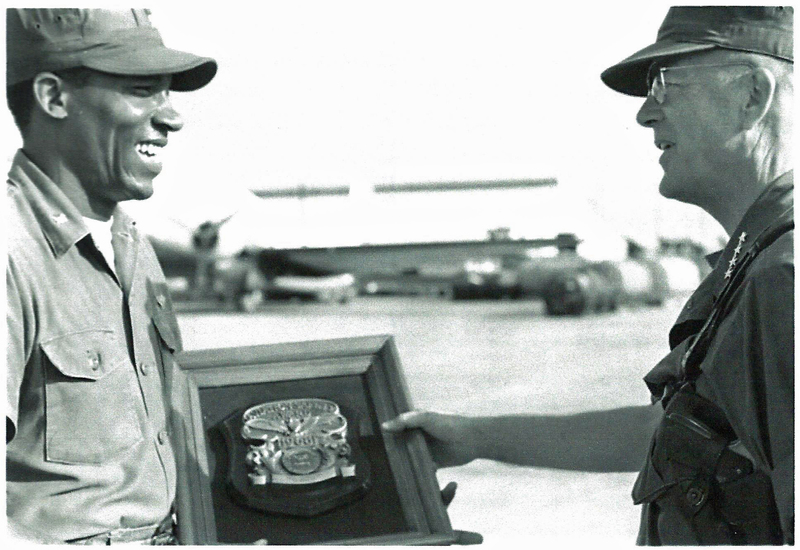 We lost our 1968-69 Chu Lai CO, Col. Frank E. Petersen, during August, 2015. 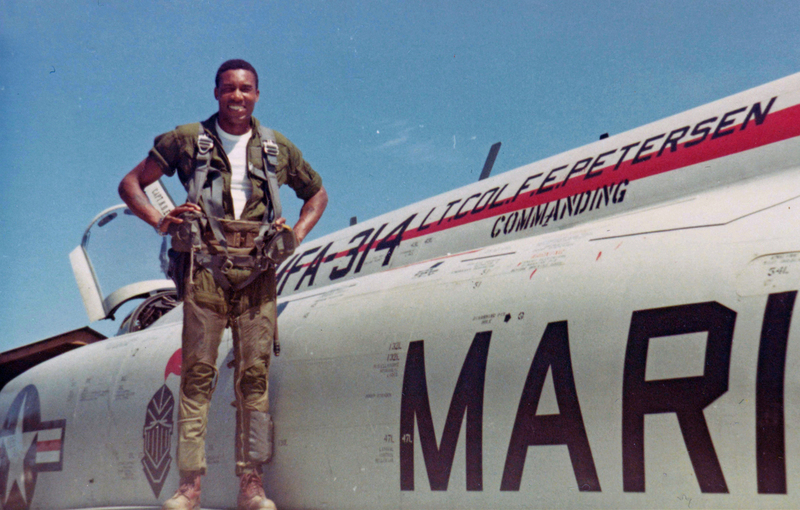 Read his obituary in the New York Times: "Frank E. Petersen, First Black General in Marines, Dies at 83"
This is a great image of a paper Phantom II model! Instructions and plans for the model are here. Thanks Heather and Ron! Washington Times - "Top 10 U.S. Fighter Jets"
There is an interesting feature on this newspaper's website, although it includes a few aircraft not normally considered "fighters". It's most interesting to the Black Knight community because "aircraft #1" on the feature is the F-4B Phantom II as flown by VMFA-314 during its deployment to Chu Lai. More interesting - the photo is one taken by Bob Schmitt, author of this website, returning south from a mission, off Dan Nang, April 1969. 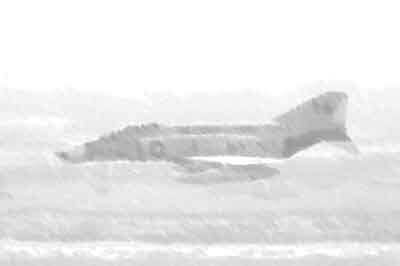 The photo was provided long ago to The Wikipedia Phantom II website (link directly above). It would be nice to get a small royalty payment from the Washington Times for each viewing! We received an email from Jay Jessup: "Would like to inform you that my father William B. Jessup (Bill) past away in his sleep this past Friday night (November 29th) from complications of his cancer. Not sure if you have a notification process, but I would like to request (if you do) to let the other Black Knights know of his passing. In place of sending flowers, should anyone like to make a donation in his name, please do so to Hospice of Kauai (4457 Pahee St, Lihue, HI 96766)." Earlier Jay wrote: "I am the eldest son of Bill Jessup who was a Black Knight pilot at El Toro MCAS in the early 60’s. Unfortunately, Dad is losing his fight against cancer and it just a matter of time before he joins his fellow Marines guarding heavens gates. The reason for the note to you is, Dad has asked me to reach out to see if any of his squadron mates he could reach. It is my hope that you can lead me in the right direction." Also from Penny Jessup: "I am Bill's ex-wife and caregiver. I am working on something that is more biographical (than the published obituary) - with what I know of his earlier life and military history. I know that he filled billets with VMA-223 (8/60 - 8/62) and VMFA-314 (8/62 - 11/64). I would welcome input from anyone who has info about Bill's life in the Corps. An obituary is on this page. A great pilot and good friend, Joe Garzik, passed away on November 3, 2013 at his home in New Bern, NC. I flew many hops from Chu Lai in the back seat of Joe's F-4 and never doubted we would have a safe and successful mission. Years later, Joe authored a book about his flight experiences, "City Hall". And still later, Joe invited me in 2009 to join him on a drive along Route 66. We did the entire historic road - Chicago to Los Angeles/Santa Monica. A great adventure. Joe will be missed very much. An obituary and more are on this page. We lost Black Knight pilot Gil Tanzer on July 6, 2012 at his home in San Diego with his wife Carol by his side. 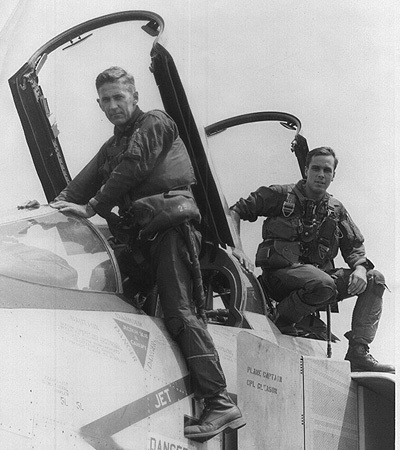 I flew in the back seat on Gil's first hop in Vietnam and later on a memorable CAS mission that got a good report. 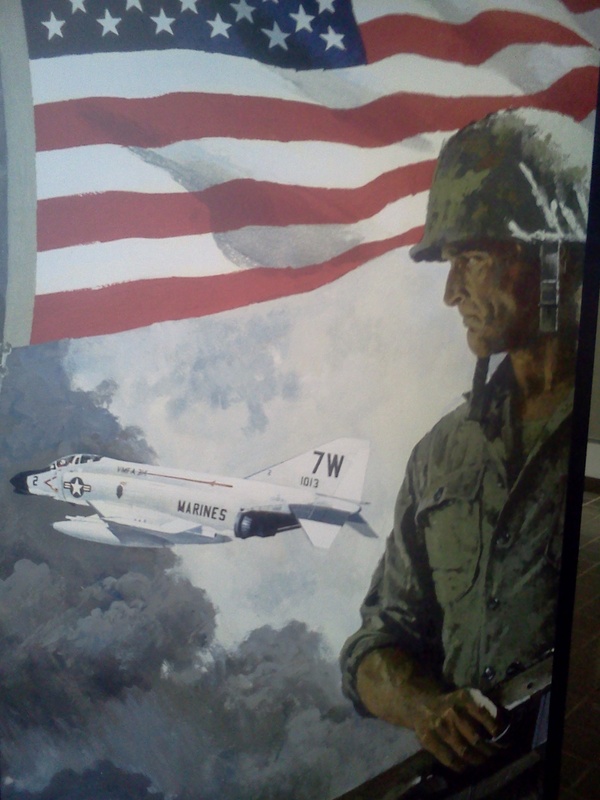 "US Marine Corps F-4 Phantom II Units of the Vietnam War"
"David fought a good fight but he lost the battle Tuesday evening 10:56 on November 20, 2012. Just wanted you folks to know, Dana"
Dave's obituary from the Washington Post is here and a photo of him in Chu Lai is also on that page. A forum for all Black Knights and fans is (potentially) here. We are still in "ground school" on this, but it was briefly "airborne", before suffering "flak damage" (much spam). I cannot be a full-time moderator, so send me comments. We need volunteer moderators! Inspired by the upcoming Foray, a video of Chu Lai images and floor show soundtracks has been posted on YouTube. Play it loud! 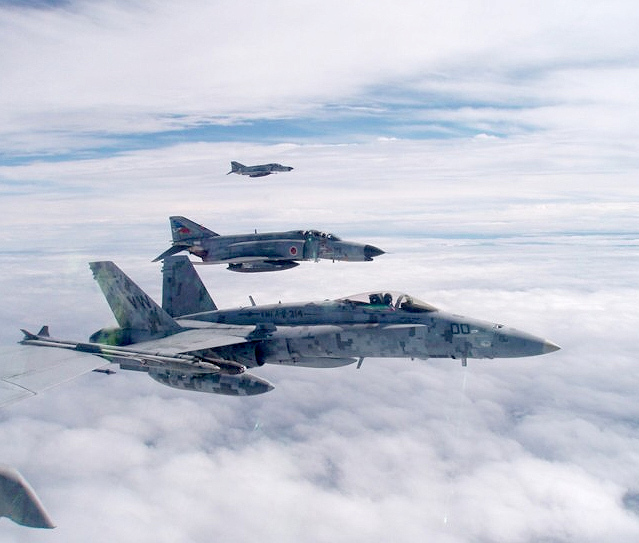 We Had the Phantom Foray (All Marine F-4 Reunion) and It was Great! Highlights of the Foray will be posted soon - over 700 squadron members, families and friends came to see each other in San Diego. This was the October 22 update on the all-Marine Phantom squadrons reunion November 1-4 in San Diego. It has a very full schedule of events and the separate dinners planned for the squadrons. 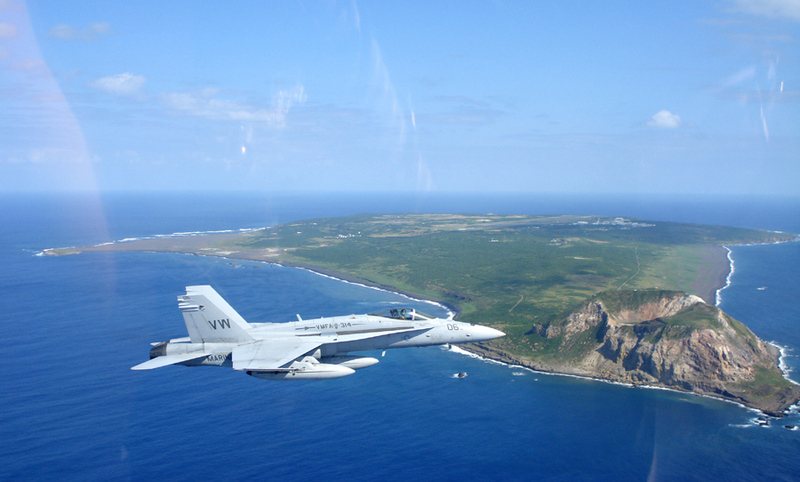 Details of the VMFA-314 squadron dinner, November 2 are also here. VMFA-314 History - Sent to the Publishers! Great news - Mike Wanamaker provided news on October 13 that the VMFA-314 manuscript has been delivered to the publisher. Mike and Lee R. De Haven have been working on this for several years and it seems copies may be available at the Foray. I've done a very superficial scan of the book and am very impressed with the detailed research that Mike and Lee have done into the F-4 history with VMFA-314 and the many, many operations that the squadron was involved in, not only in Vietnam but also through the years from 1962-1982. I think we all have much to learn from this book. Click on the cover below for availability and how to order. 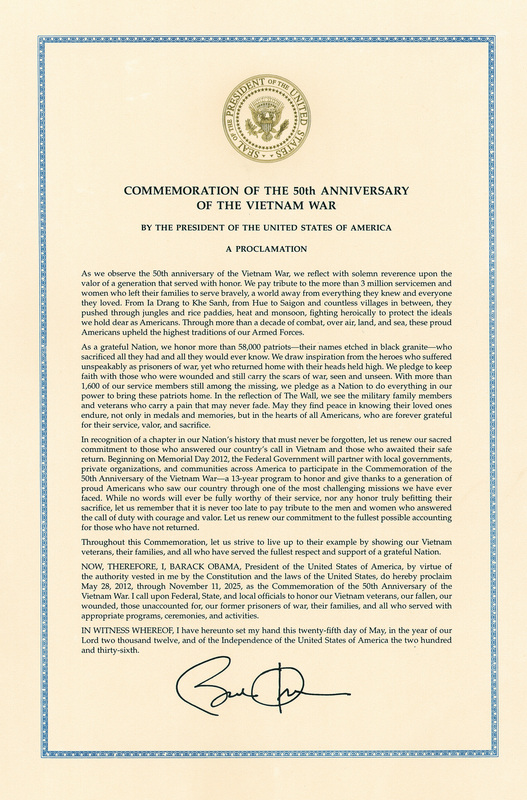 We missed this document on the 50th anniversary of the Vietnam War when it was published, but since it kicks off a long period of remembrance, it will remain relevant for a long time. If the image below is too small for you to read, click it for a much larger version. Thank you, President Obama. Here is an interesting website with a ground-level view of this heavily bombed area. All Marine F-4 Reunion - Urgent News! With just a short time to go before the Foray, we are happy to learn that San Diego Beer Week is also taking place from November 1-11. The organizers state it: "promotes San Diego's thriving craft beer culture by sponsoring a ten-day countywide festival that attracts beer tourism, fosters knowledge of our regional brewing heritage, and serves as a showcase for San Diego's breweries, restaurants, pubs, and other businesses with ties to the craft beer community." Just a coincidence that it also overlaps the Marine Corps Birthday and Veteran's Day? I think not! The deadline for guaranteed reservations is October 1! Go to the September Update link below! Put the upcoming MARINE F-4 PHANTOM FORAY at the Town and Country Resort, San Diego on your calendar. The dates are Thursday 1 November thru Sunday 4 November 2012. Early arrivals will be Wednesday 31 October and checkout Sunday 4 November. Contact F4Phantom@afri.com for info on how to get on the mailing list and for more details, or write to me. I have collected basic contact info on everyone who contacted this website and have sent that list to the organizers also. Be there! "Thanks for taking our survey. Additional information will be sent via email in January, 2012. If you would like to add email addresses to our list, please send them to mollydey@afri.com"
If you are interested, read this email and send your name and any others you know to the email address below! 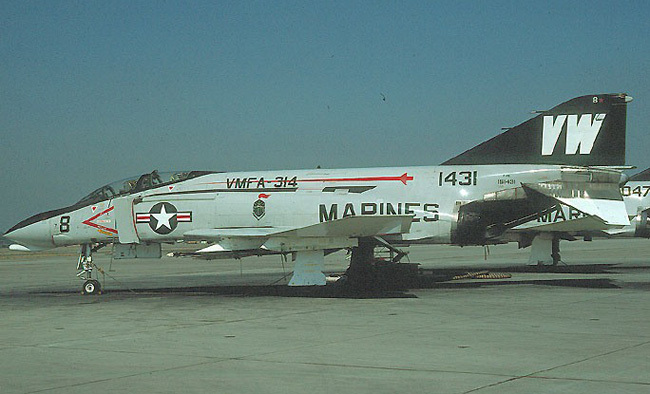 Lancer (Mike Sullivan) has come up with a great idea to have an all Marine F-4 Reunion to include all aircrew and maintenance support personnel (including wives, family, friends) who have ever flown or worked on this great bird during its’ lifetime with the Corps and Reserves. The proposed reunion will take place November 1- 4 at the Town and Country Hotel in good old San Diego. The venue will be similar to other reunions, Thu-Sat, with Squadrons, ready rooms, etc.. In order to advance the planning and reservation of space we need to know as soon as possible the number of people who think they could possibly attend. To this end, we are asking each of you to forward this to as many others as you can think of, and they do likewise, to get maximum dissemination of this event. What we are looking for now are email addresses. Armed Forces Reunion, Inc. has agreed to compile these addresses in a mailing list to send out a survey to each address. Each time this message is forwarded please cc: Ted Dey (ted@afri.com) so they may update their list. The main thing now is to get the word out. AFRI needs to get this survey out as soon as possible so we can lock in the site. So if you can please forward within the next day or so. This is going to be the mother of all reunions. Let’s make it happen. National Air and Space Museum - "Fly Marines! 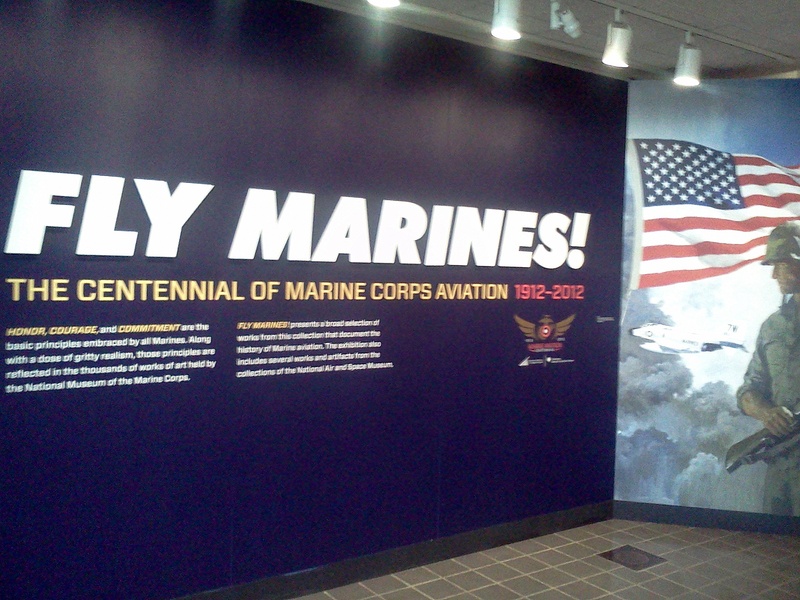 The Centennial of Marine Corps Aviation: 1912-2012"
There is a great exhibit at the NASM for the 100th anniversay of Marine Corps aviation and the Black Knights are especially honored to have a VMFA-314 Phantom from the Vietnam era to be on the entry banner. However, why is the MODEX (tailsign) "7W" rather than the proper VW? Photos from Dan Proudfoot. Thanks, Dan! "My Grandfather Major John T Ryan was the CO of the Black Knights for the original arrival of the F4 at El Toro. He flew in WW2 and the Korean War. One squadron he was previously with was VMF-311 with Ted Williams and John Glenn. This past February I took a family trip out to San Diego to get a tour of VMFA-314 at MCAS Miramar. Our tour happened to fall on the weekend of the 100 years of naval flight celebration so there were a lot of aircraft stationed at the airfield. I was wondering if you have come across anything relating to my grandfather?" 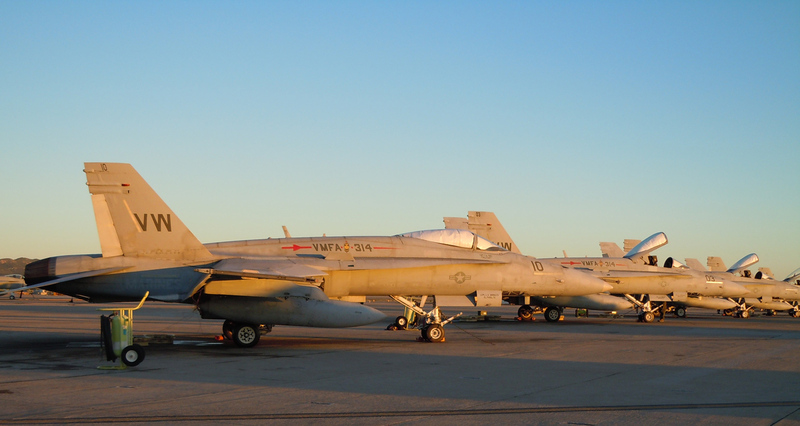 and he included a current VMFA-314 F-18 photo. Thanks! We were very happy to hear from VMFA-314 "vintage 1969" pilot Bob Franklin, looking for the 1968-69 cruise book as scanned. In return, Bob loaned us a copy of the 1969 cruise book which is now available on a DVD from this site. Thanks, Bob! The book includes a photo of the Hanson Award, which was received for 1968's records - nice to see the actual trophy/award. It also includes a photo of the November 1968 "crash landing" by Maj. Carl Black with me as the RIO. See "Marine Phantoms in Vietnam" This photo has been published five times, but only once with an accurate caption. 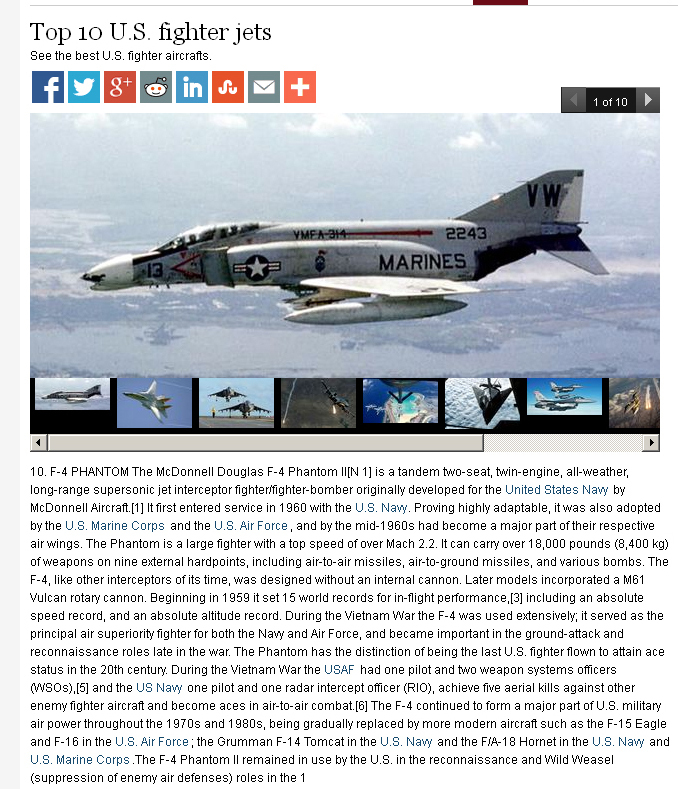 Although it's now two years old, the Air & Space magazine had a good Phantom article: Where Have All the Phantoms Gone? Finally, soon-to-be-published author Mike Wanamaker reported on his VMFA-314 history, "I have the "last" edits to incorporate, as well as about two dozen photos from 1964-1965 or so. These include the USS Valley Forge transpac." Having seen a previous draft of this book, I hope Mike is able to squeeze in enough time to get this out! 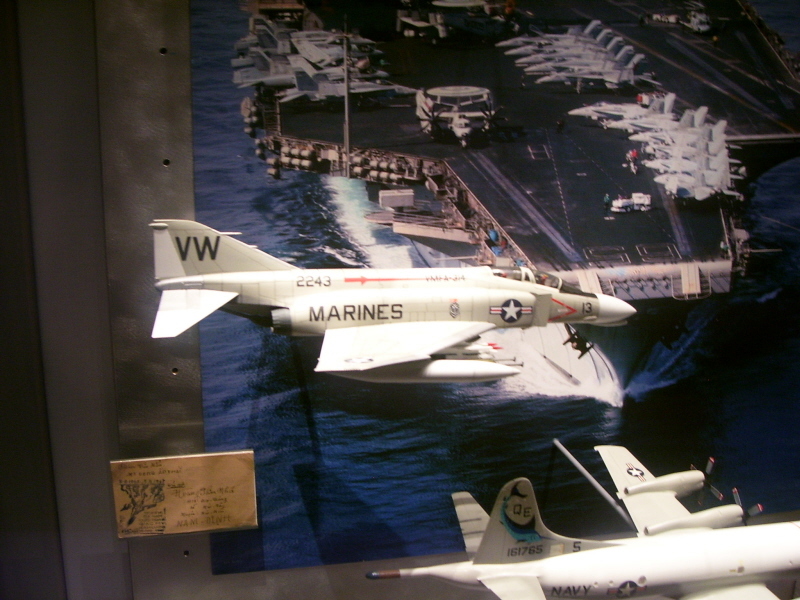 Dan wrote, "The only F4 Phantom photo in the entire museum (besides the up-close of the J-79 engines), and it's one from dad's squadron, the VMFA-314 Black Knights!!! !!!! Too cool!!!!!" I added, "...if you look closely you can see lettering in the spear, Col Norm Gourley. He was group commander and nickname, 'Animal'. Nice guy, I flew with him a few times." 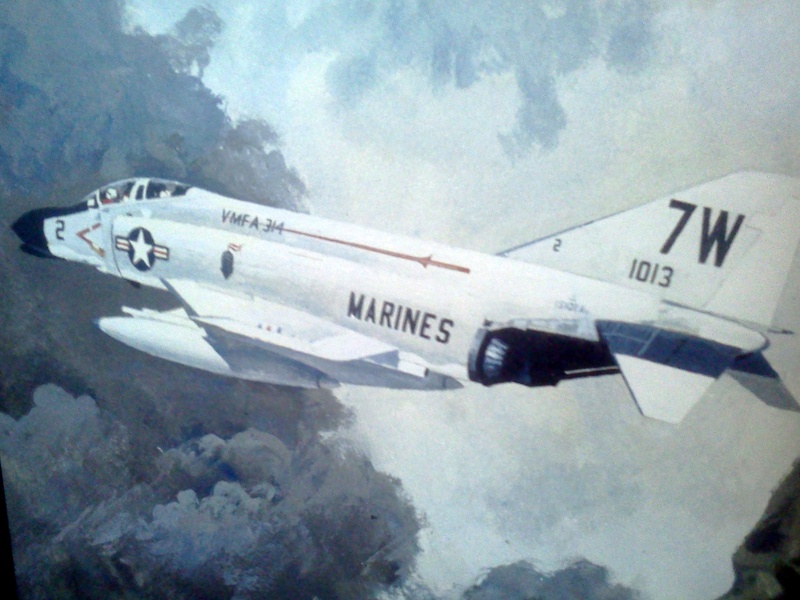 The same F-4, 153037, appears in a color illustration in "USMC Phantoms in Combat" (page 25) but the caption misspells Col Gourley's name. Mike Wanamaker wrote to us, "As for the history project, I think we're done collecting material. I hope we can get this thing to the publisher some time soon (probably "soon" on a geologic time scale). 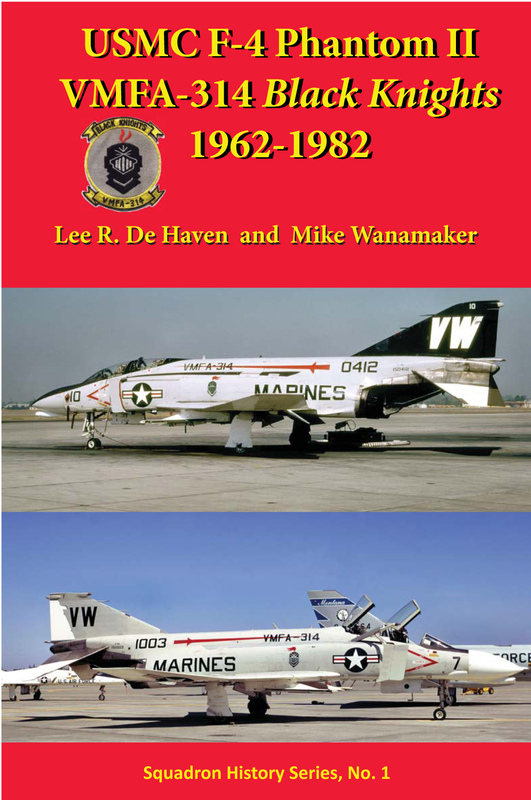 As noted a while back, Mike Wanamaker and his co-author, Lee De Haven are writing a history of VMFA-314 during the 1965-1970 era. A few squadron members contributed photos and stories to this work; others expressed skeptical non-participation. I've seen the early drafts, which are highly detailed - think this is an excellent project! If you want to be involved, contact me and I'll forward your interest on to Mike. "I found your website and was wondering if you could assist with something. We want to paint one of our birds up in an F-4 Phantom tribute paint scheme. We want it to be as close and authentic as possible with colors and layout (right down to the exact paint if possible!) Do you know if there are any old 314 airframers/painters around who would be interested in helping us get this right? Here is a photo of the paint scheme we want to replicate. If you know anyone who'd be interested in assisting with this, please forward this along to them. We are all fans of the mighty Phantom and think a current Black Knight Hornet painted as such would be a pretty cool "tip of the hat" to the Black Knight Phantom drivers who wore the patch before us." Let's get behind this project! email me with your ideas or willingness to help! Subject: VMFA-314 "How Frank Got His Helmet Back"
Background: Dale Anderson emailed me in late January to get a CD/DVD of the scanned 1968-69 squadron cruise book. He mentioned a flight helmet and Frank Hunsaker, who obviously dumped it after he and Don Evans ejected from their Phantom early May, 1968. What a "trophy"! ".... Is the Frank Hunsaker the Evans F Hunsaker III who got shot down once outside of Khe Sanh? If it is, ask him if he still has the brain bucket he was wearing that day that was given back to him on Okinawa on his way home from Viet Nam! Funny what you remember more than forty years after the fact! SEMPER FI!" "... Frank Hunsaker is indeed the same guy, but he told me in December his first name is Isaac - I never knew. Don Evans was the pilot on that flight. Frank (Isaac) has a jazz radio show on Fridays, on http://www.kmhd.org/ - you can listen online and I think there's a studio phone number on the site. I called him once. Look for "Mornings On Macadam with Issac" on that site." "Dale: Are you the Marine who gave me my helmet in Okinawa? If you are, give me a buzz or reply to this. I still have the helmet as my war souvenir & am thankful to this day for the Marine who found, saved and presented it to me as I was on my way home from Vietnam in December 1968. Semper Fi!!" "Yes, I'm the Marine who gave you the helmet. Well, Joe Justin and I did it. The look on your face was absolutely PRICELESS! I think you were MEANT to have that helmet. Before I went to Viet Nam the Marine Corps sent me to Vietnamese language school. One of my fellow students was Joe Justin. After graduation we all went to Viet Nam. In November of '68 I got medevaced to Japan. Unable to return to CONUS because I didn't have enough time in-country, and not healthy enough to go back to Viet Nam, they had me working on Okinawa pushing troops back to CONUS. I don't remember how I knew you were on Okinawa, but I told Joe the guy it belonged to was on the island and we decided to give it back to you. (A few barley pops may have influenced our decision!) At any rate, we finally got our act together - Joe was late and we ALMOST missed you! - and we got to see the look on your face when you saw that helmet again! That's what I mean when I say you were MEANT to have that helmet. A lot of little events lined up just right. How often do things like this happen! I'm glad you got home from your tour in Viet Nam safely, that the helmet serves as a reminder and that I had a small part in events. "Bob: This is amazing! Thanks again for forwarding Dale's original message to me." This is the BEST VMFA-314 story I've heard in about 10 years! An amazing tale from Dale! Bob"
"He had decided to live forever or die in the attempt, and his only mission each time he went up was to come down alive." Travel my way, the highway that's the best. There are many photos, the GPS track and a 2-hour+ DVD - listen to some music on a new webpage. 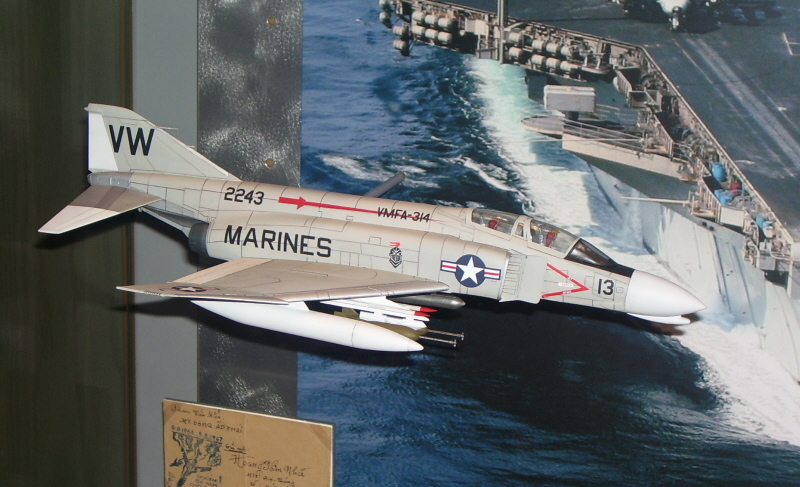 Thanks to many years of effort by Phantom pilot Dave Gould (Chu Lai, 1967-68), the re-opening of the USNA museum on August 29, 2009 included a model of VMFA-314, Vietnam era Phantom F-4B. Great work and excellent results Dave! How do I get a copy? For the 2007 reunion, VMFA-314 pilot Bob Fraser created a terrific DVD from his Super 8 movies taken in 1968 from the cockpit of the F4B, with ground shots to further the story. Send me an email if you would like more information about this DVD. Bob has told a detailed and engrossing story of this time. Copies are available as of December, 2009 for $7 plus postage. Squadron patches are still available for $7.50 each. A sample appears at the top of this page, created for the reunion from the versions used in 1968-69. If you want a patch, send me an email as above. In late 2007, we heard from two '80s vintage squadron members, Mike Wanamaker and Lee De Haven, who are writing a history of VMFA-314 during the 1965-1970 era. Several squadron members have contributed photos and stories to this work. The first draft was put on the VMFA-314 wiki in January, 2008. An excellent project! We already have three squadron authors: Frank Petersen ("Into the Tiger's Jaw: America's First Black Marine Aviator") , John Trotti ("Phantom Over Vietnam") and Joe Garzik ("City Hall"). Can any other squadron match this high "literacy level"? The squadron cruise book for 1968-69, "The Black Knights Continue the Fight" has been scanned and will soon be available online at medium resolution. A high-resolution, 200 dpi scan is available on a data DVD for $3, including postage. Add the 1969 cruise book on the same DVD for $2 more, or $5 total. Email me. Several tape recordings by Bob Schmitt, George Proudfoot and Frank Hunsaker have been converted to CD. These include in-cockpit mission "chatter", a "Hello America" report on a Phantom crash landing, and several "O" Club floor shows. Single CDs are $3 and all recordings in a set will be $10 when editing is completed, postage included. Inquire about further details. 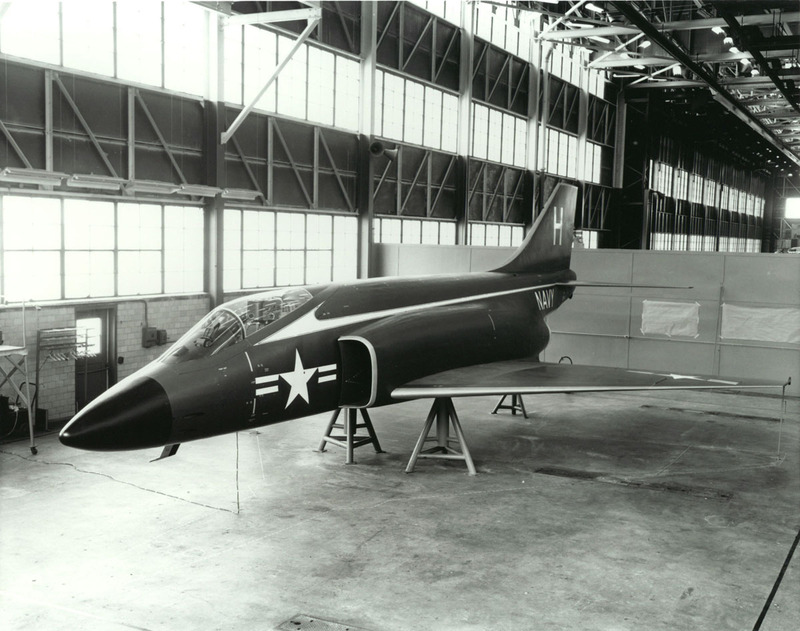 "The YF4H-1 prototype made its maiden flight on May 27, 1958, taking off from Lambert-St. Louis Municipal Airport with McDonnell test pilot Robert C. Little at the controls". They're coming one after the other now. Each day seems to bring another heartache – articles in professional journals, invitations for "the last of" events, calls for yet another "Old Guy Reunion", order forms for coffee table books. I'm beginning to realize that there's no putting off the fact that one of the most revolutionary, capable, and elegant airplanes ever to dominate the skies has gone away. I refer, of course, to the F-4J Phantom II. Over the last several years the grand old boy has taken his leave. With the F-4J goes the notion of variable Intakes, radar intercept officers, and 2.0 indicated Mach number on the airspeed gauge. And with the F-4 also goes a big part of what made my life noteworthy, dare I say, the stuff of novels. The Phantom had an amazing run: thirty-plus years, the Vietnam war, dozens of brushfires and contingencies. Few airplanes in the history of aviation have adapted as well to the tactical landscape over their years in the inventory. 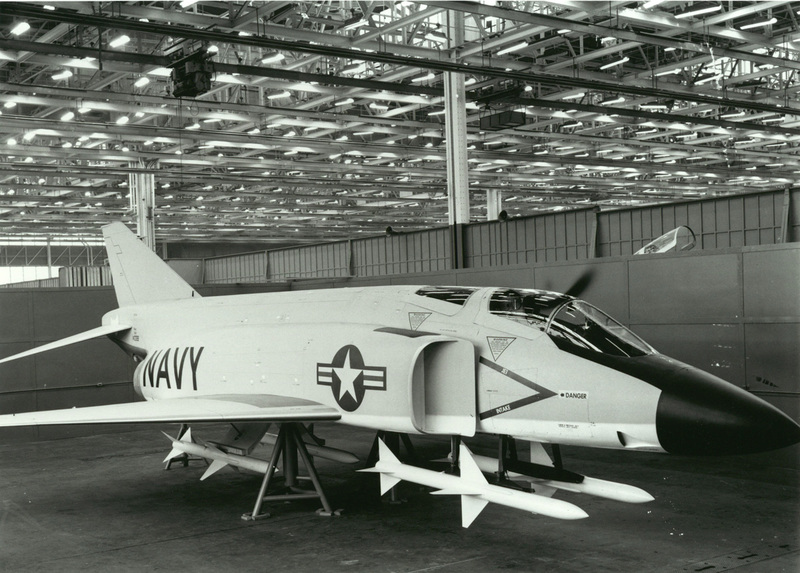 The F-4 was designed by McDonnell Aircraft Company as an intercepter aircraft round the radar missile system, a long-range air superiority fighter that pushed out the boundaries of fleet defense. The early portion of my flying career was about launching on the Alert 5 and escorting Soviet bombers and transports. Those were the days of the 1+45 cycle, the days when the Phantom was the fuel critical jet in the air wing. The thought of dropping bombs was anathema to us then. But the threat changed as the Viet Nam War dragged on and other mission requirements meant the Steely eyed fighter pilots had to load Mk-82's on the wings and prove they were capable of beating up the dirt almost as good as any fully trained attack puke. Suddenly the Phantom, with its two-man crew and newly received upgraded radar was the platform of choice for air superiority in high threat areas. 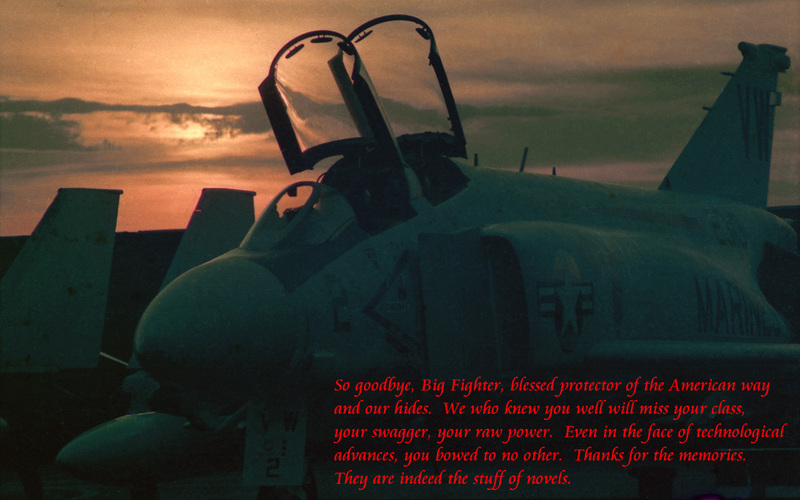 But now the F-4's time is over. Emotions stir in the face of this reality. Thousands of hours of my adult life were spent strapped into the front seat of the "Big Ugly Fighter." It was there that challenges were met, friendships were forged, and the nation's will was carried out. From that lofty perch I looked up at the heavens and down on hostile lands. I didn't always realize it then – youth, of course, is lost on the young – but each sortie was a gift. So, too, was the time spent in the company of greats. I think back on chain-laden plane captains who loved the airplanes as much as we did, those like Sam Summa who kept the aviators going with their enthusiasm in the face of long days that promised nothing but more hard work. I remember the maintenance master chiefs who taught me not just how the Phantom works but how to be an officer and a man. And for their caring they asked for nothing in return. In their countenances I saw my responsibilities. Anyone familiar with Naval Aviation has a de facto doctorate in pilot personality types. Any RIO with 1,000 hours or more in the airplane possesses a similar degree. And as I flip through the pages of my weathered logbooks and read the names – Smith, Crenshaw, Southgate, Driscoll, Ensch, Roy, Bouck and hundreds more – I think of their skill, skill that boggles the mind even now, and the teamwork between cockpits that made flying the F-4 so rewarding. I know few things as surely as I know that U.S. Navy carrier-based pilots are the best in the world. And what of the down times between sorties? In my mind's eye I conjure up a gathering in the eight-man stateroom where problems are broached, dissected, and solved. This is where I learned about trust. This is where I realized I could survive the trial that was life at sea – hell, life period. Now I close my eyes and hear the clack, clack, clack of the shuttle as it moves aft for the next launch. The exhaust from the powerful and reliable J-79 engines fills my nostrils until we drop the canopies and bring our jet to life. Air roars through the ECS. Systems power up. Soon we're parked behind the cat, waiting our turn. I roger the weight board – 56,000 pounds, buddy, 56,000 pounds. Grasp that, if you can. The jet blast deflector comes down and we taxi into place, deftly splitting the cat track with the twin nose tires. And then – even after decades of doing the same thing – the adrenaline starts to flow as we go through the deck dance unique to the Phantom: The nose strut extends, giving the fighter the look of a beast ready to leap into the air by itself; the director moves you into the holdback. Wings spread. Flaps lower. Our hands go up as the ordies arm the missiles, bombs. There's the signal from the catapult officer. I put the throttles to military power and wipe out the controls – stick forward, aft, left, and right; rudder left and right. "You ready, C-ball?" I ask. I run the fingers of my right hand across the top of the lower ejection handle (for orientation purposes) and hear from the back, "Ready Queenie, I'm right behind you." I salute. We both put our heads back slightly. (forget once and you get your bell rung by the head rest). A couple of potatoes later we're off. Airborne. And for the next hours we stand ready to bring this machine, this manifestation of American know-how, to bear however it might be required. Or maybe today isn't our day to save the world, so we accommodate one of the small boy's requests for a fly-by or break the sound barrier -- just because we can (and we're far enough above our fuel ladder to get away with it). We're flying a Phantom. And we're getting paid to do it. Alas, I speak of days gone by. What remains of what once gave my working life purpose is now only found in front of main gates, aviation museums, and VFW halls around the country. In the blink of an eye I have become the white haired guy with the ill-fitting ball cap and the weathered flight jacket who bores young ensigns (and anyone else who happens to make eye contact) with his tales of derring-do. "VF, dang it!" I rail. "Those were real fighter squadrons." And they were. Fighting Falcons, Jolly Rogers, Swordsmen, Pukin' Dogs, Grim Reapers, Diamondbacks – mascots of an adventure. At the center of it all was the airplane itself, and when an airplane has so much heart, personality, and character it ceases to be inanimate to those who climb into it on a regular basis. So it's goodbye, dear friend. Forgive my depression. I've heard the promises of a brighter future, but my time in the arena was with you. I watch you launch into the sunset and wonder how it all could have passed so quickly. It doesn't seem like that long ago when we were together, inextricably linked, one defining the other. Ours was a world of unlimited possibilities and missions accomplished. Ours was a world of victory. The VMFA-314 Black Knights of Chu Lai, 1967-1970, had a Great Reunion! First report of the Reunion! It was great! If only "sunny" San Diego had lived up to its tourist posters, it would have been perfect. We did see a little sun, but the temperature never got much above 60. Nevertheless, we had more guys - with spouses and friends - than expected, with nearly 90 folks at the banquet and about the same number at the other venues and functions. We'll have a combined action report with photos someday, but at this point it's another "mission accomplished" for the Black Knights!